Cinnamon-sugar toast with lots of butter is one of my favorite comfort foods. It makes me feel so cozy. I took those warm and fuzzy flavors, and baked them into this coffee cake. The cake is soft and fluffy, with a slightly crunchy topping, and the drippy glaze seals the deal. Between the cinnamon-and-sugar laden cake batter, the buttery brown sugar topping, and the vanilla cream cheese glaze, it’s my idea of the perfect coffee cake. Take that, Entenmann’s. I made the cake, using my favorite foolproof, one-bowl, easy cake base. It comes together with a whisk, no mixer needed, and is simple enough to be made at a moment’s notice. 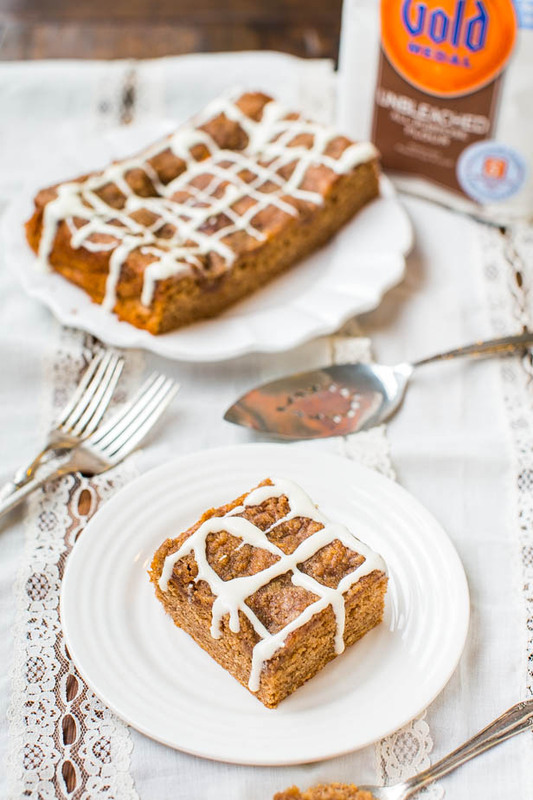 I made a Cinnamon Roll Coffee Cake along these lines last year, and it’s been very popular with readers, but this one is even easier and more streamlined. I love to bake because it’s a creative outlet and it helps me relax, but only if the recipe isn’t overly complicated or fussy, and this coffee cake starts with a bowl of dry ingredients and a bowl of wet. Pour the wet over the dry, stir, pour into a pan, top with the brown sugar mixture, and bake. Nice and easy. Since I loathe dry coffee cake, I used a trifecta of tricks to keep it super soft, moist, and tender: Buttermilk, Greek yogurt, and oil. Buttermilk helps keep cakes soft, springy, bouncy, tender, with the perfect balance of density and fluffiness. The results are unparalleled. You can make buttermilk by souring your own milk. Add about 1 tablespoon vinegar or lemon juice to 1/2 cup milk, wait for 10 minutes for it to curdle, then use as indicated. If you don’t routinely keep buttermilk on hand, I highly recommend this Powdered Buttermilk. If you don’t use buttermilk much, but sometimes see a recipe that needs a half cup, but because you think you won’t use the rest of the jug before it goes bad, you opt of trying the recipe, then this powder is your new best friend. Shelf stable, keeps for ages. To make sure the cake has a nice pop of cinnamon flavor, I used one tablespoon cinnamon in the cake batter, and there’s one teaspoon in the topping. For a cinnamon fiend like me it’s perfect and I don’t think too intense, but if you’re more sensitive to cinnamon, you may wish to dial it down, possibly even halving it. After whisking together the easy cake batter and turning it out into the pan, add the buttery brown sugar topping. When you mix up the topping, it looks like streusel topping, with some pea-sized clumps and some sandy bits. However, while baking, the brown sugar and butter melt, and the topping turns into a caramelized wall of brown sugar. Best tasting wall ever. 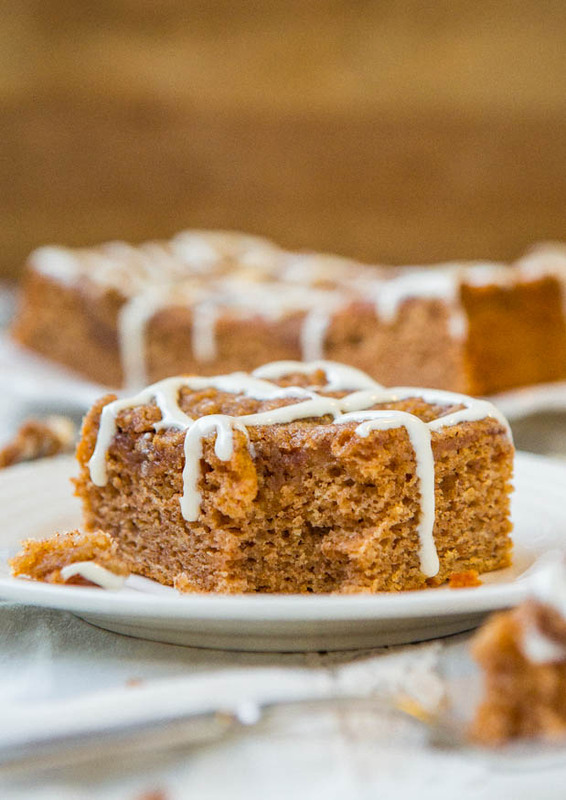 The simple vanilla cream cheese glaze is the literal icing on the cake. Sweet and light, with a slight tang, and it’s the perfect contrast to the warming cinnamon and nutmeg flavors. If you don’t have cream cheese on hand, you can use butter instead. 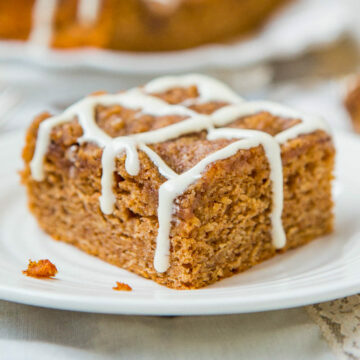 The cake is springy, bouncy, and very moist, with just enough density to give it some heft and dimension, while the contrasting brown sugar top layer is buttery, firm, crispy and flakey. 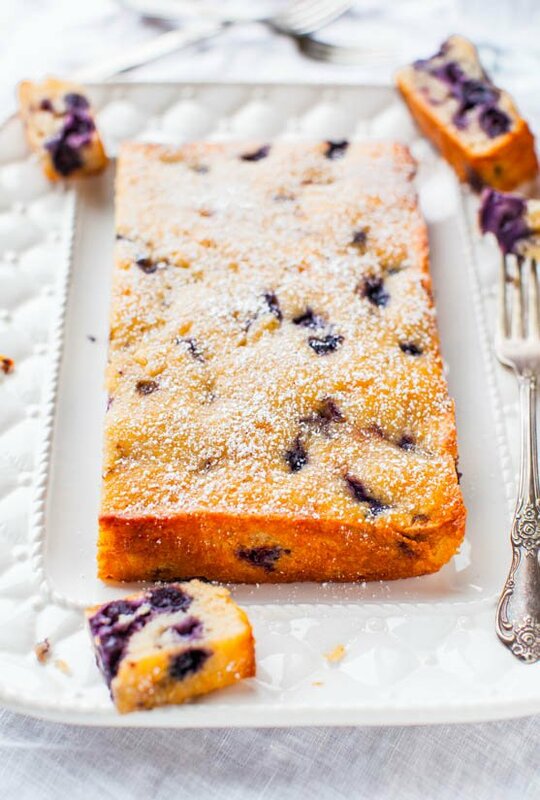 It’s the perfect cake for a brunch, on Christmas morning, or just because it’s a Wednesday. It’s cake I want to eat on the couch, curled up with a blanket, with a book in one hand, and a mug of hot coffee in the other. My ultimate (pipe) dream is to be served this cake as a breakfast-in-bed cake, but I’d have to believe in Santa Claus in order for that to be a reality. The cake is soft, fluffy, light, and very moist, with just enough density to give it some heft and dimension. In contrast to the cake, the slightly crunchy brown sugar top layer is buttery, firm, crispy and flakey, and nicely complements the springy, bouncy cake. The cake is fast and easy to make, and the batter is whisked together in minutes, without needing to use a mixer. 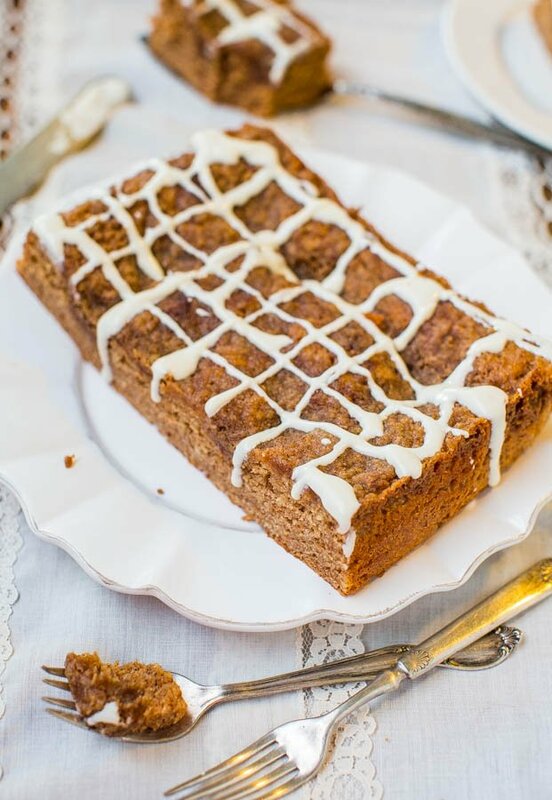 I love cinnamon, and the cake is pleasantly spiced, but if you’re more sensitive to cinnamon, you may wish to dial it down, possibly even halving it. 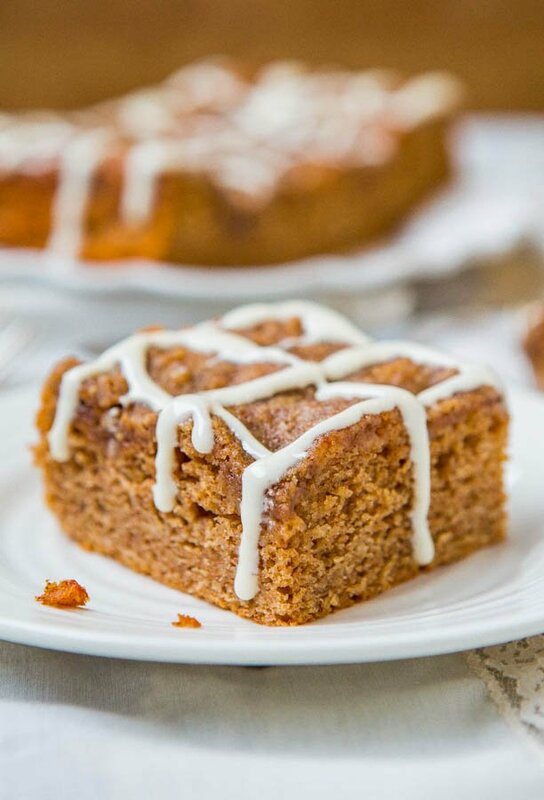 The vanilla cream cheese glaze is sweet and light, with a slight tang, and the perfect contrast to the warming cinnamon and nutmeg flavors. 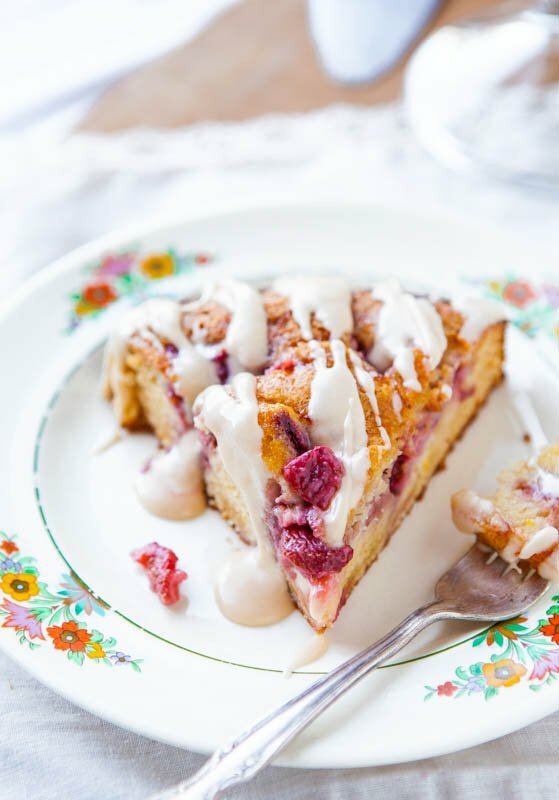 It’s the perfect cake for a brunch, on Christmas morning, or for a rainy day because it’s easy to make on a whim. It’s the type of cake I want to eat on the couch, curled up with a blanket, with a book in one hand, and a mug of hot coffee in the other. Preheat oven to 350F. Line an 8-inch square pan with aluminum foil and spray with cooking spray; set aside. Brown Sugar Topping – Combine all ingredients for topping in a medium bowl, and mash together and toss with a fork until pea-sized clumps form. There will be some sandy bits and some small clumps; set bowl aside. Cake – In a large bowl, whisk together flour, granulated sugar, baking powder, cinnamon, nutmeg, optional salt; set aside. In a large measuring cup or separate small bowl, whisk together the next 5 wet ingredients (through vanilla). Add the wet mixture to the dry, mixing lightly with a spoon until just combined. Small lumps will be present and this is okay. Don’t overmix or try to stir them smooth; set aside. Batter will be on the thicker side. Evenly sprinkle brown sugar topping mixture over cake batter. Bake for about 35 minutes, or until a toothpick inserted in the center comes out clean or with a few moist crumbs, but no batter. Watch your cake, not the clock, and always bake until done, whatever that means in your climate and oven, given the ingredients you used. 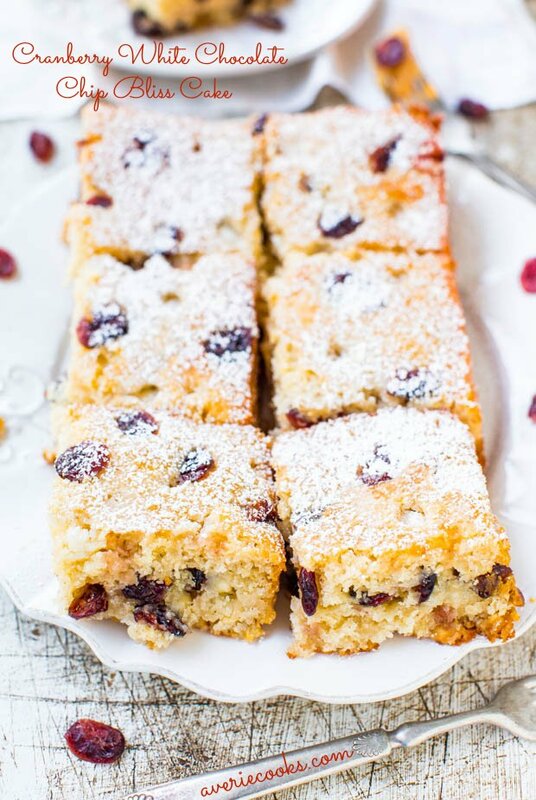 Place pan on a wire rack and allow cake to cool for at least 30 minutes before optionally glazing. While cake cooks, makes the glaze. Vanilla Cream Cheese Glaze – Combine all ingredients for glaze in a small bowl and whisk together until smooth. Depending on desired consistency, you may need to play with the sugar and milk ratios slightly. Alternatively, this buttery vanilla glaze or this browned butter glaze are also great. Evenly drizzle the glaze over the cake before slicing and serving. 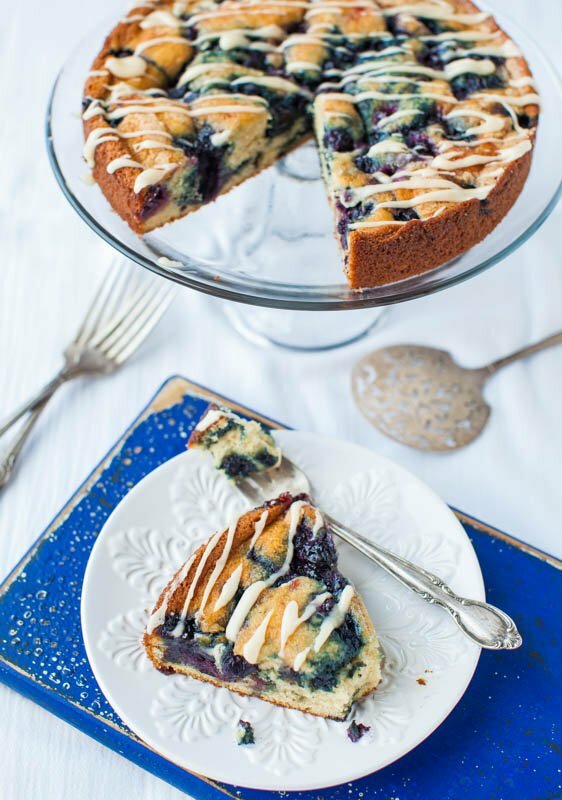 If you only plan to consume a small portion of this cake or plan to keep it around for a few days, you may wish to glaze it in portions and as needed, rather than all at once or in advance. Cake will keep airtight at room temperature for up to 5 days. I’m comfortable storing glazed cakes at room temperature, but if you’re not, glaze only the portion you plan to consume immediately. 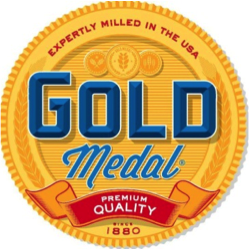 This post was brought to you by Gold Medal Flour. Recipe and opinions are my own. 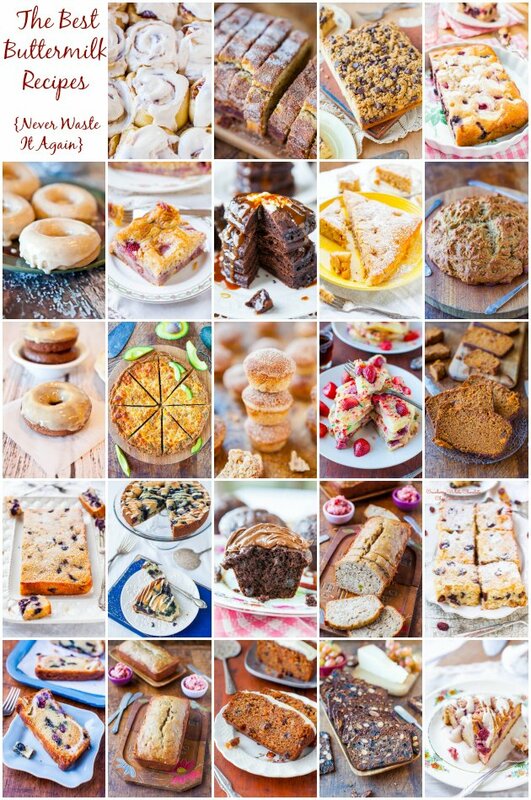 What’s your favorite coffee cake? Averie, I’m a fiend for cinnamon too so this is perfect. I love that you use the word “cozy” when describing these flavours because that’s exactly how I feel looking at this cake. I want to be in my pjs, with a big hot mug of tea, watching Christmas movies and eating this pan of cake. 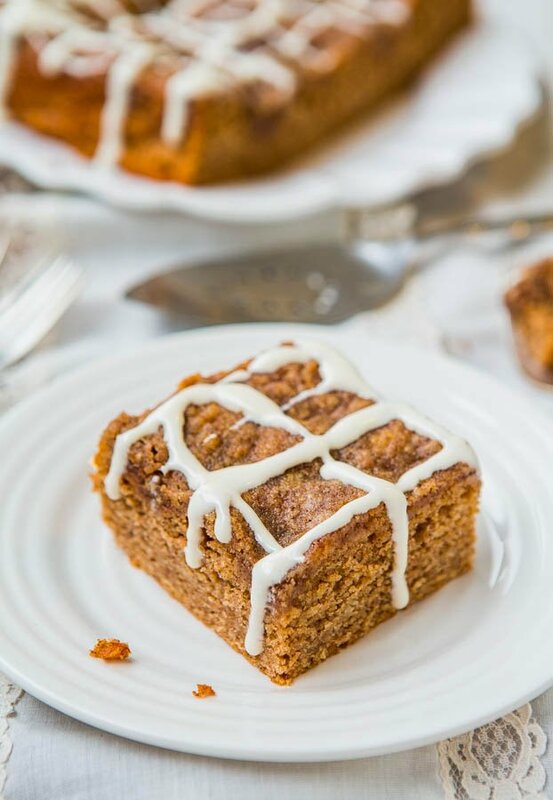 Especially when you say magic words like these –> “However, while baking, the brown sugar and butter melt, and the topping turns into a caramelized wall of brown sugar” Wowza! Thank you for another delicious-looking coffeecake & one without sticks of butter in it. Amen to the butter. I mean who doesn’t love it, but I don’t like to workout, that much, to want to run off 2 sticks of butter :) Sometimes I wonder why ppl just keep adding so much when there are other ways (And better I find) to creating a soft, moist, and flavorful cake! I have a weakness for coffee cake. as in, I can eat it at all hours of the day! And frequently do! That’s awesome that you’re such a big coffee cake fan! :) And I’ve been seeing your ‘Nog Cookies everywhere! They look so good! This looks so yummy! Love all the cinnamon in it! Yum Averie! The frosting on top is calling me! It looks just amazing! What??! There is no Santa Claus?! How could there be a cake that looks and sounds this delicious and be no santa?! :) Buttermilk, oil and yogurt??!! I bet this is so moist and absolutely delicious! 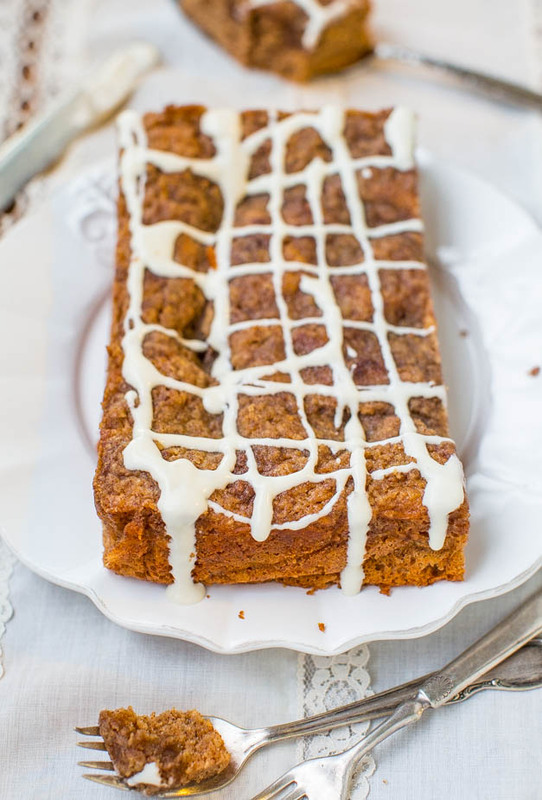 I just love a good coffee cake…and always with glaze! Love this! Wow! 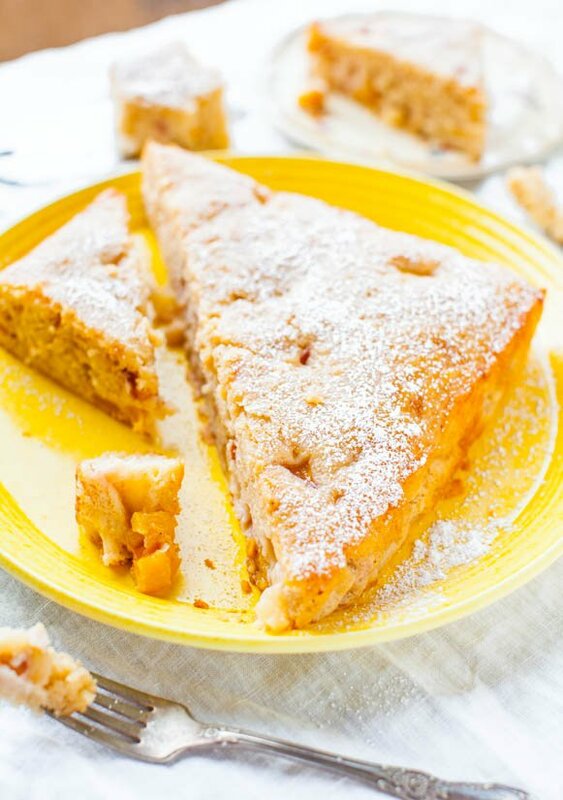 Your trifecta for a soft cake sounds delicious! I’m a sucker for anything with a glaze too, I’m definitely dying to give this a try! LMK how it goes for you! 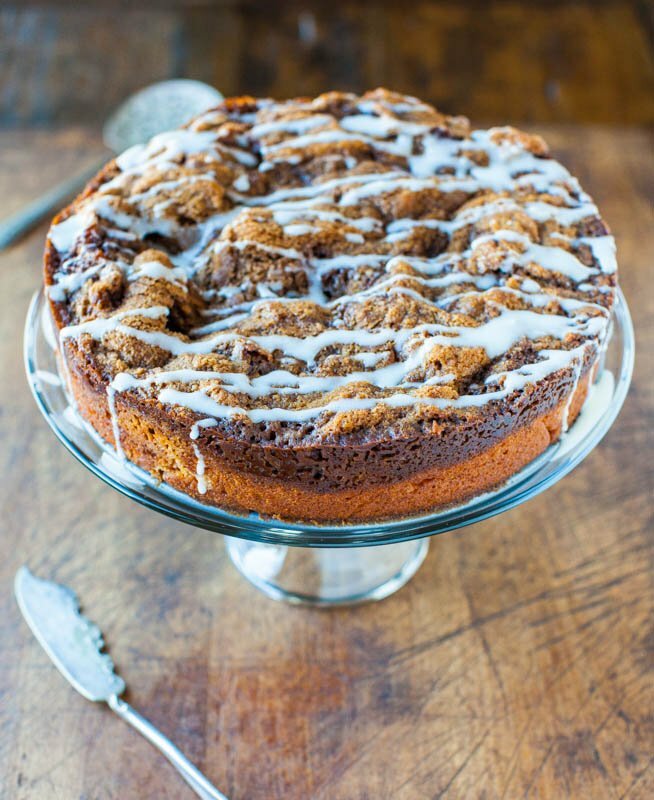 Now this is what I call coffee cake! This is a stunner! 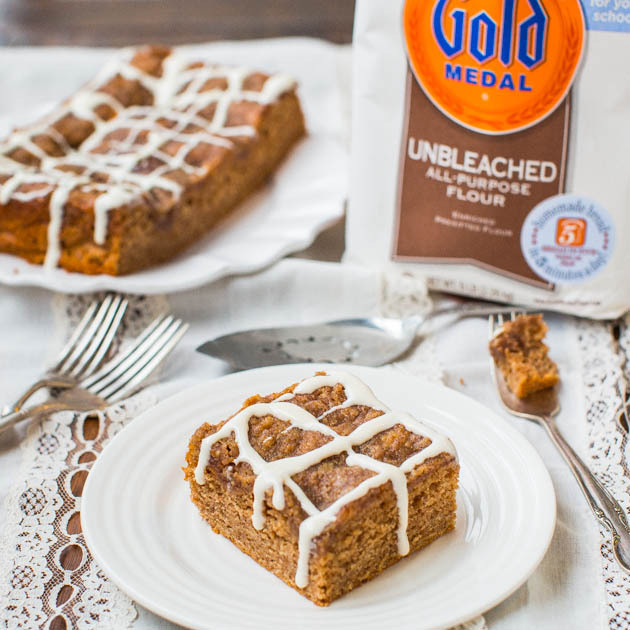 I would be the brat who picked allllll of the crumbly, buttery, brown sugar topping off of this coffee cake :D I can’t resist the stuff! That vanilla cream cheese glaze sounds heavenly, too. 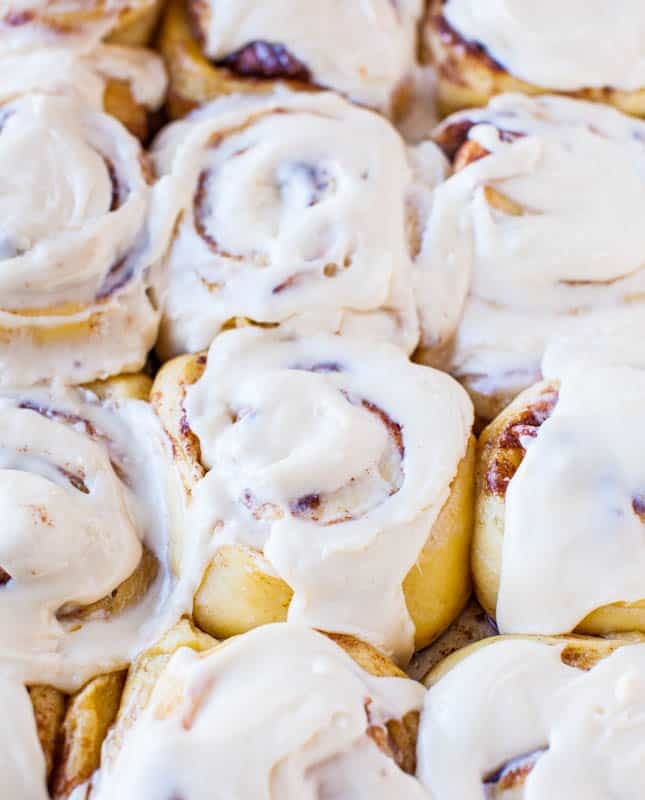 These are essentially cinnamon rolls in loaf form, yet still every bit as dangerous! Very good! Thanks for pointing me to this recipe. Today is my day off so thought, why not give it a try, and I’m very glad I did! My husband said ” thumbs up”, I think I will give the cinnamon roll coffee cake a try next, I’ll let you know if I do. This recipe = YUMMY ! Good bye bisquick coffee cake ;) thanks again! 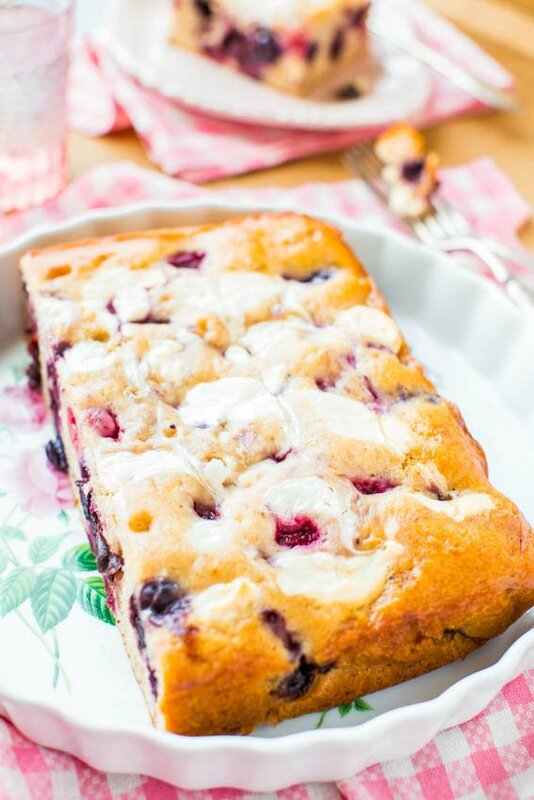 If you’re at all wanting to branch out from cinn roll or snickerdoodle/cinnamon flavors and looking for a berry-based cake, these are all really great & you can use frozen berries. Whatever you end up making, keep me posted! Made this this past weekend, and it was AWESOME! Thanks, Averie! Thanks for trying it, Colleen! I’m so glad you loved it & thanks for LMK!